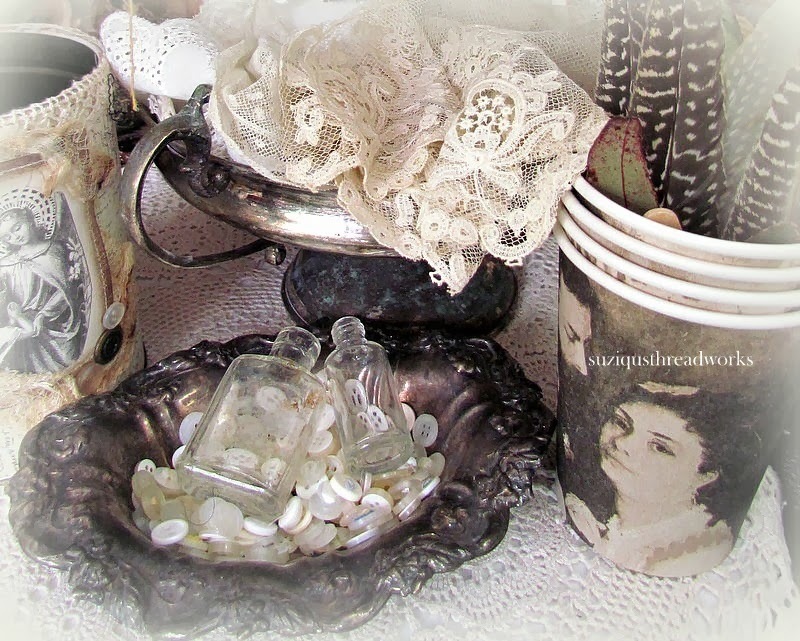 with vintage potion bottles, pearl buttons and sweet net laces. Not only do you create such beautiful things, but you display your 'makings' artfully too! Hope you feel better, even if it takes many time after losting someone e love! So pleased to see you creating once again. 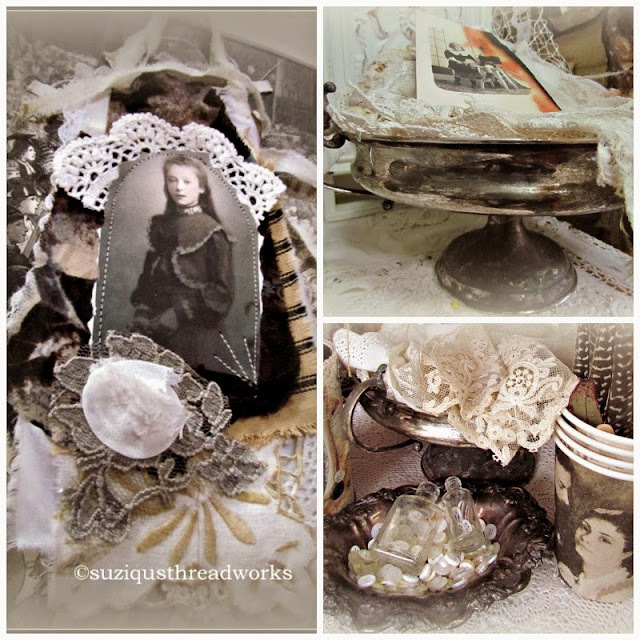 Beautiful, my dear Suzy, the hanger is gorgeous with that lovely image from P.W.and your fantastic way of mixing and matching pieces of fabric and lace. Your display looks as sweet and charming too,- You are an artist in many wayes ,sweet friend. I will think about you all, friday,my friend. So much lovely eye candy! Thank you. Sweetie, this is such a beautiful post. And that's a tag??? Goodness me, it's a piece of art in itself. So gorgeous. Love your beautiful displays too. Love your calming beautiful creations...I will make one of my own today, just for me! I listened to your Deep Peace Choral at the bottom of your page. is a version I have sung for 32 years. I thought you might enjoy this version as well. My hubby and I were part of a double mixed quartet and we sang this at a very difficult time in our lives, and it was very healing for me. I hope it calms and feeds your soul as much as the one you have on your blog. Oh how beautiful this post is dear Suzy!!! The collages you made with your beautiful photos are gorgeous, as is that lovely tag. I can never see enough of your art...oh why can't we be next door neighbors??? You post before this one stole my heart. I got to glimpse into your amazing property and see those precious goats. I think I in love with that little guy!!! Have a wonderful day my lovely friend. You do create some beautiful pieces of artwork Suzy, your colour and texture combinations are gorgeous. I never tire of working with lace, crochet and time worn fabrics. I love the styling you use to display your work too. I am a sucker for all those tiny bottles. I have a bunch, but I am never sure how to display them. I like the idea of them being surrounded by buttons. Great display. Hi Suzy! What a gorgeous post, All that eye candy is stunning as is your tag! So sorry to hear about your friend. How wonderful that you are there to help. Thank you for posting my giveaway! Its very much appreciated. Life has been very busy for me as well, not much time for blogging these days. Hope to catch up soon. 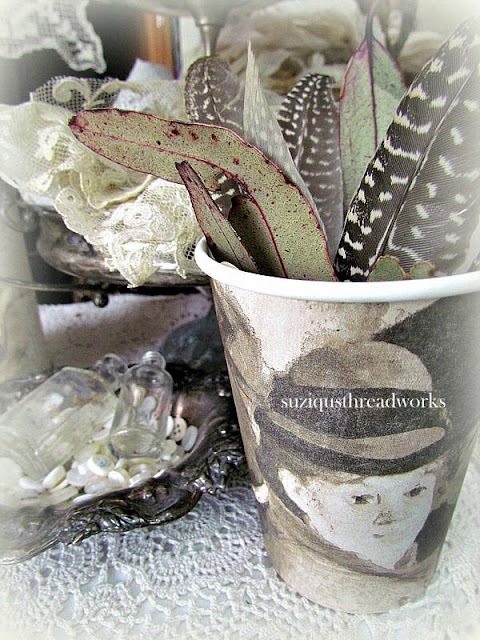 Always a joy to visit your blog dear Suzy. Such beauty you have created here and displayed so elegantly! Have a wonderful day. Hey Suzy lovely work as usual, your pictures always look good. Always running behind these days. did you make them or purchase them someplace? Gorgeous photos, as always, dear Suzy. The tag is breathtaking... 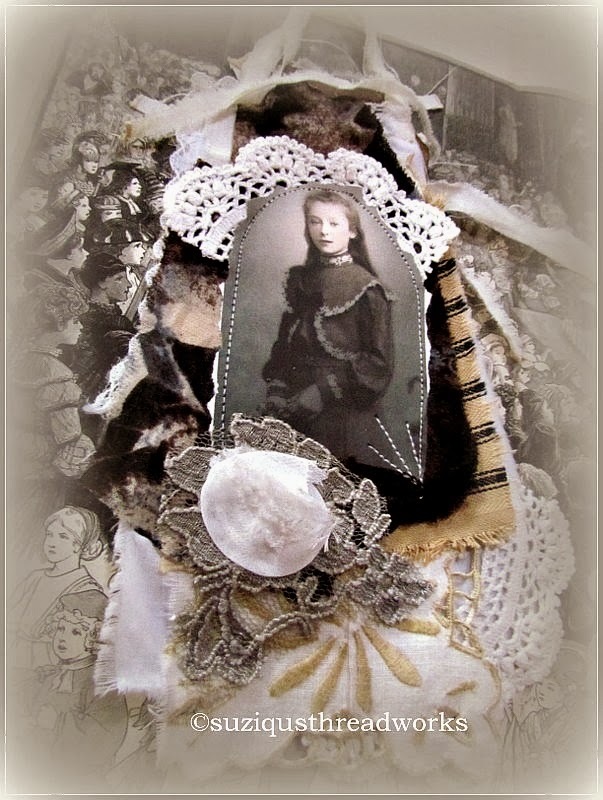 I especially love the bit of lace at the top of the photo of the young woman--it highlights her pretty face so perfectly. The little collection of leaves and feathers beautifully complement your laces, buttons, and bottles. What an eye you have for composition! You create such lusciousness with fabric, fibers, and lace! And, I know everything you make is made with love and joy! This piece here is fab in new whites greys and blacks. Stunning! I also love your softened images.